Telepath offers an all digital voice and data two-way radio network offering incredible signal quality and coverage throughout the Northern California Area. 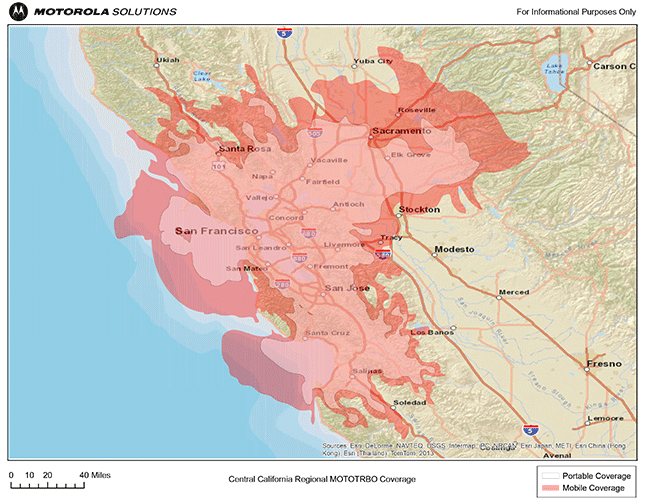 The current radio system configuration consists of Motorola's Connect Plus tower sites providing communications in San Francisco County, Alameda County, San Mateo County, Santa Clara County, Santa Cruz County and Monterey County, and Contra Costa County. Rapid access for back to back transmissions. Off-Air network for car-to-car tactical operations. 100% software defined equipment guarantees feature growth. Military grade durability for shock, vibration, dust and water proof for 30 minutes at 3ft depth. Very affordable/attractive return on investment. Rental plans available allowing agencies to bundle equipment and the airtime on one monthly invoice.